I am currently reading Douglas A. Campbell recent monograph on Paul, entitled, Framing Paul: An Epistolary Biography (Grand Rapids: Eerdmans, 2014). Campbell is recognized as one of the most influential Pauline scholars writing today and so, as with any new book from his pen, this new publication is receiving a great deal of attention. In particular, Campbell is known for offering bold and original readings of Paul. In that regard, Framing Paul does not disappoint. It contains much material worth talking (and blogging!) about. 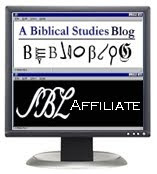 (See T. J. Lang's post on Chris Tilling's blog). However, since the Second Reading in this Sunday's lectionary offering is taken from the Letter to the Ephesians, I'd like to take a moment to mention the important contribution Campbell makes to the study of this letter. "And when this letter has been read among you, have it read also in the church of the La-odiceans; and see that you read also the letter from Laodicea." Campbell's argument for the Laodicean destination of "Ephesians" is interesting but it's not what I want to focus on here. While Campbell challenges the traditional understanding of the destination of the letter, he actually supports the traditional view of its authorship, arguing that the letter is, in fact, an authentic work of Paul. This is obviously going to be controversial. Despite the fact that the author is identified as Paul in two places in the epistle (1:1; 3:1), many scholars today question the veracity of that attribution. Beginning with Erasmus in the sixteenth century, doubts have been raised about whether or not the letter actually represents a true work of Paul. For example, any contemporary scholars have argued that the tone and style of the letter seems unlike Paul. In fact, other epistles attributed to Paul such as Colossians and 2 Thessalonians are also dismissed as pseudonymous works, i.e., works written under a false name. “But it has been customary to ascribe to Solomon other two, of which one is called Wisdom, the other Ecclesiasticus, on account of some resemblance of style—but the more learned have no doubt that they are not his; yet of old the Church, especially the Western, received them into authority—in the one of which, called the Wisdom of Solomon, the passion of Christ is most openly prophesied.” (City of God 17, 20; NPNF1 2:387). I can't get into all of the arguments about the Pauline epistles here. In fact, rather than address the plethora of issues involved in the question of the authorship of these letters, many scholars prefer to simply leave such epistles out of their analysis of Paul's thought. You might, however, hear some of them in the homily on Sunday. Nevertheless, it should be mentioned that there are some important defenders of the authenticity of the disputed epistles. In fact, a significant shift seems to be occurring as a growing number of leading scholars have written works arguing that such epistles have been wrongly rejected as pseudonymous works. Luke Timothy Johnson, for example, has taken a stand as an ardent defender of the authenticity of the so-called "deutero-Pauline" epistles (The First and Second Letters to Timothy [AB 35A; New York: Doubleday, 2001], 55–90). Another major Pauline scholar, Michael Gorman, has also supported the view that Paul wrote Ephesians (Apostle of the Crucified Lord: A Theological Introduction to Paul and His Letters [Grand Rapids: Eerdmans, 2004], 501-2; he also thinks Paul wrote 2 Thessalonians and was ultimately responsible for Colossians). are highly likely to be Pauline, even if (a concession to the weaker siblings; I do not myself find this plausible) they were written by someone close to Paul and doing their best imitate him. (Paul and the Faithfulness of God, 1:60). 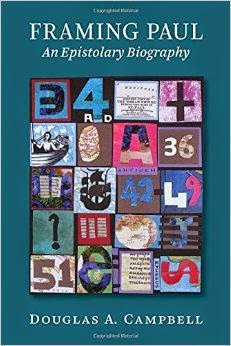 With Campbell's book, we now have yet another leading scholar making a case for the authenticity of these epistles. And, just to be clear, as anyone who follows Pauline scholarship knows, it is not every day that one finds Campbell and Wright singing the same song. In fact, "singing the same song" may be a misleading way of the describing the situation here. 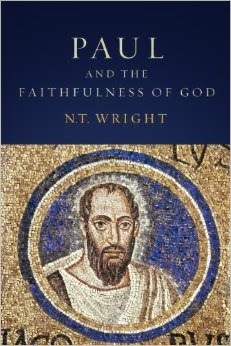 For whereas Wright deals with the question of the authenticity of these letters in passing in Paul and the Faithfulness of God, Campbell offers a detailed examination of the relevant issues in Framing Paul, offering substantive and original contributions to the discussion. Let me take a moment to highlight just one aspect of his treatment of Ephesians. Campbell takes on one common objection to Pauline authorship, namely, that the tone of Ephesians seems unlike what is found in the other genuine letters of Paul. Among other things, a cluster of ideas that is often thought to form the heart of Paul's message--"works of the law," "faith", "justification"--receives scant attention in Ephesians. However, this challenge in terms of absence is as inadequate as the preceding challenges. . . [I]t is questionable simply on its own terms that this cluster is necessarily coherent for Paul. It occurs only in parts of Romans (principally 1:16-5:2 and from 9:30, fading by 10:17) and Galatians (from 2:15, fading through 3:26, recurring in 5:5-6), and much more briefly in Philippians (see 3:6 and 9 in the context of 3:1-11, i.e., it seems to have characterized the Previous Letter to Philippi). This is not a promising distribution for material supposedly coming from Paul's properly basic convictions. Hence, when we turn to Laodiceans [Campbell means, "Ephesians"], its passing acknowledgment in 2:8-10 might well be an appropriate reflection of its relative importance alongside the rest of Paul's concerns, viewed in the broader context of his authentic letters--and this is, in any case, a stronger representation of the material than we find in 1 and 2 Thessalonians, Colossians, and Philemon. . . But Laodiceans [=Ephesians] has an even stronger card to play in its own defense at this point, indicating here how it can defend itself against any or all charges of substantive silences concerning material well represented in the major letters. Because of its location prior to the composition of these letters, Laodiceans [=Ephesians] can turn the tables on these objections and suggest that when this distinctive material occurs in a letter written later, we have a good prima facie case for that material's fundamental contingency. The boot, it seems, is on the other foot. Advocates of the importance of material deemed absent from Laodiceans [=Ephesians] but present only in parts of 1 Corinthians, 2 Corinthians, Galatians, Philippians, and/or Romans must now make a case for the importance and centrality of that material. . . . In short, this challenge in terms of a supposedly pregnant substantive silence in Laodiceans [=Ephesians] should be laid to one side--although by considering it, we have identified another strength in the location of Laodiceans [=Ephesians] in 50 CE within our broader frame. Not only does this allow us to explain certain emphases within Laodiceans [=Ephesians] (and Col) as possible echoes from meetings that had just taken place in Syrian Antioch and Jerusalem, but it removes the need for Laodiceans [=Ephesians] to justify any of its silences concerning material that occurs in the later letters. Because these letters did not exist when Laodiceans [=Ephesians] was written, any silences in relation to their concerns are hardly a problem automatically. . . (Framing Paul, 331-32). I look forward to finishing this provocative and original book. It seems my list of top academic reads of 2015 has its first entry. So, does he think Onesimus, bishop of Ephesus, issued the first collection of Paul's letters, and that's how it came to be called Ephesians? undisputed" letters of St Paul undisputed? Campbell doesn't speculate as to how the book's destination got confused. Something like you suggest would make sense but I don't think he sees Onesimus as bishop. Interestingly, it is Tychius Paul sends to Ephesus, probably because he was able to read the letter and Onesimus could not (Campbell; Eph 6:21). Campbell also has some insightful suggestions about possible ethnic differences between figures in the region, but I can't get into why that is convincing here. Epaphras also plays a crucial role in the Colossians community. Finally, Archippus seems to also have an important leadership role among the Colossians (Col 4:17). Campbell thinks there was greater structure at Colossian church and that the Ephesian community was in an emerging stage when the letter was written. On course, whether the role of bishops and presbyters (and others) were clearly defined at this point is also a valid question. There may have been some development of doctrine/order happening in different stages in different communities, e.g., see the reference to bishops and deacons (though no presbyters) in Philippians 1:1. But I do think what you suggest makes a lot of sense. Ephesus was the major city and would have obviously eventually become something like the metropolitan see in the region (to use contemporary language). I am about half way through the book and am struggling to find anything that is both new and valuable. He is surely not the first to say that we should not expect Paul to discuss justification in every letter. Often he repeats other people's ideas. The novel bit is perhaps the sequence but I am finding his arguments here exceedingly weak. For example, he observes that there is no evidence that local Christians sent greetings in Col and Phlmn. This is not surprising: the addressees will want greetings from those who had visited them. Thus it is traveling co-workers who send greetings. Campbell misses this and deduces that Paul was writing from a place without a community of believers and he therefore tenuously places these letters very early. However, I enjoyed his demolition of standard sequences concerning the Corinthian correspondence. Is it still popular to claim that "Ephesians" was, in fact, a circular epistle, sent out to a geographic region, rather than a particular city? "To the saints who are [in Ephesus] and faithful in Christ Jesus". As mentioned, "in Ephesus" is missing in ancient copies (that's why it's in brackets). But what is left doesn't read naturally: "to the saints who are and faithful in Christ Jesus". If one looks at how Paul uses this phrase elsewhere the manuscript tradition would seem to require a place--to the saints "who are" where exactly? Now, some have tried to make this work other ways but their arguments haven't been convincing. It seems like the original reading had the letter directed to Christians living in a certain place. Andrew Lincoln writes, "When the address of Ephesians is compared to those in other Pauline letters, it becomes evident that the use of the present participle of 'to be' demands a subsequent geographical location." Andrew T. Lincoln, Ephesians (vol. 42; Word Biblical Commentary; Dallas: Word, 1990), 3.